Always makes me laugh when someone like the OP asks " I want a remap who should I use"
He didn't ask "all those that think stocks best please offer me your opinions on why not to remap it and as I am clearly stupid please remind me of the national speed limit while your at it "
I used DMS to remap my DB9 and Merc SL they did a good job no complaints but I have also heard their BHP etc data is exaggerated. my NA car is currently with Wayne at Chipwizards who's supposed to be the best of the best when it comes to NA remaps but I dont know about turbos . I stand corrected. So the OE turbo's on a 997.2 turbo are good for 750hp & beyond? Not that I'm interested, I'm more than happy with the power output of my car. Any additional mods for me will be suspension and chassis. The stock turbo's on a .2 are defo not suitable for 750bhp on pump fuel, no where near. Ignore any figures posted on a dynojet dyno or claimed by DMS as they are hugely inflated. There are some videos somewhere that shows you what happens when you run a DMS car at brunters against something that is properly tuned. 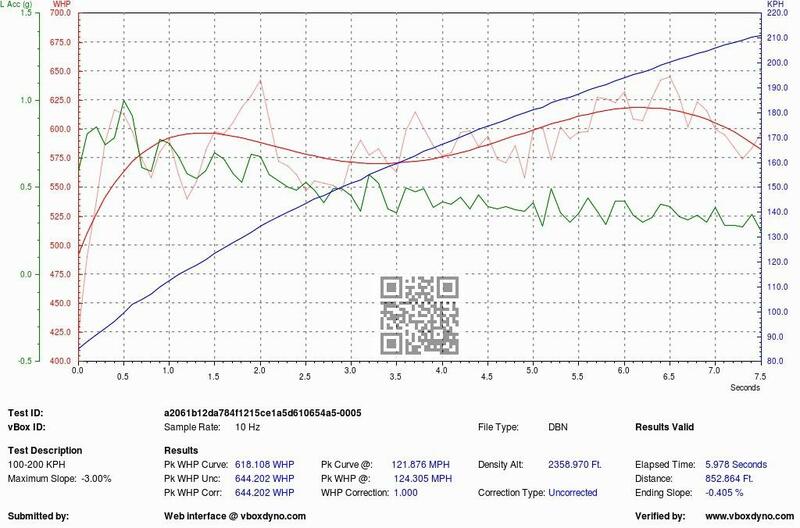 In the UK with UK figures, i have just tuned a set of hybrid GT2 turbos, which have a larger compressor wheel to 680bhp at 1.5 bar. This does 100-200 in 5.7 seconds on a Tiptronic - PDK would be quicker but this is a .1 car. You do not want to run a .2 at 1.5 bar for any sustained period of time as the bottom end is just not strong enough, that's the issue. Plenty of .2's out there globally running 750bhp on stock turbos albeit they're all running meth... as i said limiting factor is the fueling followed by the clutch / gearbox. Agree .1's need hybrid turbos to reach those figures and any DMS bhp claims.should be ignored..
You may get 750 on some random dyno pull, but under any sustained load 750 isn't practical. i'd agree 650 is the max you'd want to run one at. Look at Imi's car as an example - larger turbos than .2 and that was doing 620bhp ob all it's Vmax runs. Granted it would do more with meth, but it also has larger compressor wheels. When I tuned Tom's 911 to 720bhp, it was doing nearly identical speeds to the Mclaren 720S, which is also 720bhp - 208mph. We added meth on the same boost and we hit over 214 on the same boost (1.55 bar ) but I've not dyno'd it so don't know how much the power jumped. Hi Rick, do you think at 680bhp at 1.5 bar rods need doing mate? Will you be going this route on your own turbo? I'd love to see what that 9e MS109 race map is making on your dyno. 60-300kph in 17-18 secs. Overseas for a while but will make a point of popping over to see you next time in the UK. By the way 9e have just developed a hybrid 60mm VTG kit for the 997.2 turbo. I think the hybrids on the gen 1 are 62mm. Smaller hybrids for the gen 2 as fuelling issue already mentioned but the benefit with larger turbos according to 9e is you can run them with less boost and they produce the same power as smaller turbos running more boost. Here’s a first run for the new 9e 60mm hybrid 997.2 turbo with two passengers, vpower and 100 cel exhaust. Not bad at all. You’d knock another second of this with race fuel. Well hybrids now do work on 997.2 cars but that was not an easy development project - days and days of tuning to find what was best strategy to make it safe on pump fuel only (vpower99). We ended up using a 60mm wheel to keep great boost response since the overall goal was not outright power but a decent enough uplift on our existing stage 2 package where we don't change the VTGs. Fuel pressure is the key to these cars and this is nice and stable all the way through the rev range. We ended up back at stock ignition on the tuning with lots of changes to max air to get the power up. We have a boost strategy in place which runs up to 1.5 bar peak. There is no way to run these hybrids without the bigger cooling etc. We don't run meth so the better cooling from intercoolers and intake efficiencies is a must. Power looks around 630 or so whp so maybe around 680ps. A good result in the end. I am sure the owner will run better performance figures than us as we always like to leave room for the owner to be surprised. Ade, 650bhp on a long VMAX run with meth is going to screw your engine. I spoke ad nauseam to Manthey about tuning a gen 2 turbo with meth etc. Yes IATS and EGTs are kept cool and you trick the ECU from pulling timing but Exhaust Back Pressure is off the scale and you're literally melting your engine internals on those top speed runs. The ECU pulling timing is there to protect your engine. Unless you have a forged fully built engine you're playing russian roulette with your p and j using your solution on those top speed runs which are very hard on engine wear. This is only really a problem with VTG cars. Conventional turbos like a Garrett 3076 do not have this problem thats why they are a better solution for high horse power. There is a reason Manthey do not touch the fully forged built engine in a 991 GT2 RS MR rated at 700ps which has so much trick cooling you wouldn't believe. It also has a by pass valve on exhaust so it effectively a straight through exhaust if exhaust back pressure starts getting too high. You basically pay the Euros 70k for wheels, bigger water tank, and aero. Was there really any need for the last paragraph? The OP asked about getting his Turbo remapped last time I looked, not a full engine make over. So apart from yet another cheap dig at Ade what exactly was the point? For what it’s worth I have no connection whatsoever with Ade other than finding your almost obsessive trolling pretty distasteful. Interesting read is the crave for power and pulling like the millennium falcon in a hurry out of moss eisley !! Why would you possibly want anymore grunt on the road and even run the risk of invalidating the warranty? ^ no use asking as I don't think the OP has reappeared since he originally posted the question abnout the remap ... even if we ended up with an interesting thread. At 1.5 bar and 680 - we are around 620lb of torque and are bringing the boost in gradually - all that 1.5 bar doesn't come in at once and i don't anticipate an issues with the rods like this. Hey Ken, i'd say your 680 figure is pretty bang on. What gears are you using for the 100-200? But looking at the image we post I think it was in 2nd high up as you can see the shift - sorry cannot remember for sure. Certainly feels strong - owner has not driven it in sport/sport plus mode yet as he thought normal was quick enough. Was not planned to do hybrids but turbos were screwed so we thought we would take the opportunity. All about response rather than outright power.